16'/235hp... This dosen't seem safe! Just picked up a Glastron that has me a little confused, I have had a few over the years but never kept one very long. Used to work for a Marine in the Prior Lake/Savage area and still flip a few boats every year for fun. I don't know what exactly I just bought but I like it... Ad said 1974 GT, bow decal says GT, dash emblem says CV, looks more like a CVSS I owned a few years ago (for a month), might have a little to much motor rigged up for the boat (Rude 235hp) but it seems to handle it fine! Would like to upgrade the steering, if anyone has suggestions that would be great!! It likes to start chine walking a little at 70+, Also need some advice on repairing a few chips in the gel cost on the hull & keel. Who is good and reasonably priced? A guy I met that works at RSI in shakopee told me about CGOAMN and the web site, thanks BTW! I will post a few pics of my new find and see what the Glastron Guru's have to say. Thanks in advance for any input! The wife & I keep our Curisers in Red Wing (Ole Miss Marina) and I am definatly down for the August run I have read about... Nice & close to Harbor Bar!! That boat must move out! A 235 on a CV16!? Anyone remember what they're rated for? 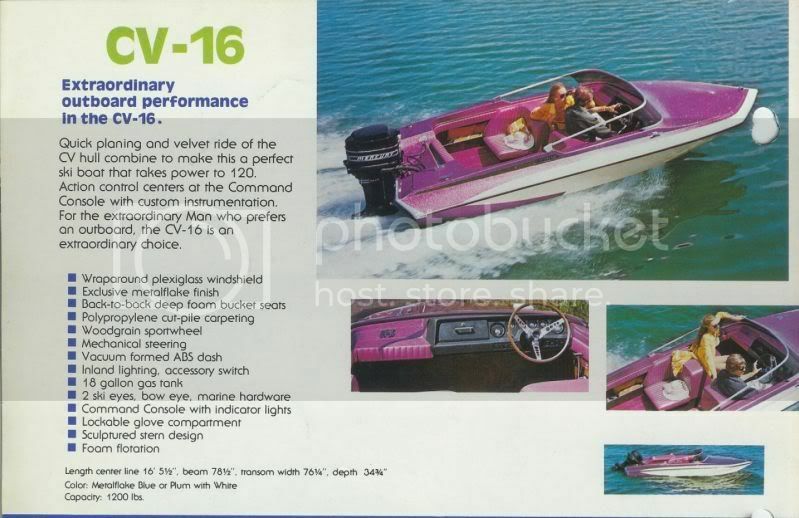 120HP Outboard is what the '76 Brochure says...I'll bet that boat fly's. Looking forward to seeing it run at the Aug meet! I'll have to agree, but what a ride right? Itâ€™s got the 74-76 dash. I'd say it's a 1975. Only year blue and white was available with an outboard. Yea, be carefull with that motor. Anything over 50mph in the CV's gets kind of scary and I bet 80 is not out of the question with that motor!! Hyperacme (Gregg) is going to be pumped to find you on the board! There is a cvx16 out there, canada I think, with a 235 on it. Numbers if I recall were High 80's with more throttle to play with. Had 74 on GPS and there was more motor left! I need to upgrade the steering before I try a WOT run... any suggestions? Been looking at SeaPro Hydraulic systems but they are kinda spendy!! Any one know where I can score one or a maybe a Teleflex dual set up?? Jerry "Jerry" has an extra dual helm steering system that should fit. Can't wait to see it on the water ! The Evinrude scares me, just lookin' at the pictures ... 74 mph ... OMG ! "Also need some advice on repairing a few chips in the gel cost on the hull & keel. Who is good and reasonably priced?" Sweet, how do I reach Jerry? Got it & message sent. Thanks! Hyperacme, Thanks for the help! Couldn't find any good pictures of decks in the 1975 brochure,. Pretty sure the CV's had "GT" stickers on decks, my 1976 had a CV sticker. In the 1975 brochure the CV16V8 has a CV sticker on the motor cover. Mojo I have a 72cv 19 and it has the Gt emblem. Sounds like the GT emblem may be correct then... Also if anyone knows where I can get a nice cover for this baby, I would appreciate the tip on that as well. The original one I got with the boat is falling appart. Thanks for all the input! I suggested Blue/Balls but the wife didn't sound to sure about that one. Think about it, old blue & with a 235, it definately has balls! If anyone has a good suggestion, lets hear it!! I like that one but it borders on cocky... maybe? For me personally, I don't like anything dirty or with a double clean/dirty meaning (ie. Wet Dreams)...I like how you worked your wife's name into your cruiser. I'd vote for anything along those lines. My 74 cv16ss says CV. I thought only the early models said GT like the 72.... Could have been replaced at somepoint on your 75.